Rob Kuznia (center), a former <em>Santa Barbara News-Press</em> reporter, is flanked by City Editor Frank Suraci and reporter Rebecca Kimitch. The three won the Putlizer Prize for Torrance's <em>Daily Breeze</em> with their coverage of corruption at Centinela Valley Union High School District. Reporter Rob Kuznia, fired by Santa Barbara News-Press owner Wendy McCaw in 2007 for union activities, has won a coveted Pulitzer Prize. Kuznia, while he was with the Torrance Daily Breeze, worked on an investigative report exposing a grossly overpaid superintendent of a small “cash-strapped” school district, according to Pulitzer officials, and was announced today as a Pulitzer winner for the series. 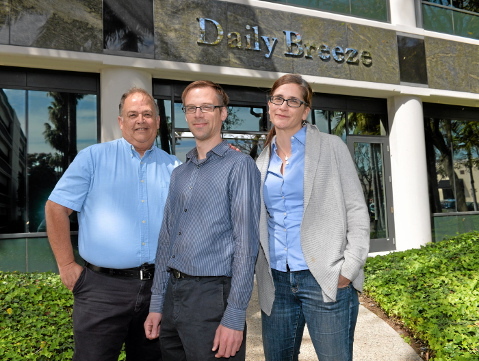 The Daily Breeze, founded in 1894, has a circulation of 63,000 and has never won a Pulitzer before this. The sequence of stories showed how superintendent Jose Fernandez negotiated perk-loaded contracts at Centinela Valley Union High School District that paid him $663,000 a year in total compensation; he also was given a $900,000 home loan at 2 percent. He is no longer with the district. Kuznia shares the prize with fellow staffer Rebecca Kimitch and editor Frank Suraci. He is now a publicist with the USC Shoah Foundation. Kuznia and five other reporters were fired after a Highway 101 bridge protest of News-Press unfair labor practices. The firings were part of what’s known as the “News-Press meltdown” that included other firings and departures by top editors, reporters, and columnists starting in 2006. Newsroom employees voted to form a union to protect themselves against what they saw as McCaw’s arbitrary actions contrary to federal labor law. She fought the union and so far has not agreed to sign a contract despite extended negotiations over the years.